[prMac.com] Anaheim, California - Independent software developer, Reggie Ashworth today is proud to announce the release of VidConvert 1.6.6, an update to his popular video converter for Mac OS X. VidConvert is a video converter designed to make converting your videos simple and easy. VidConvert will convert just about any type of video into one of the many popular formats of today. 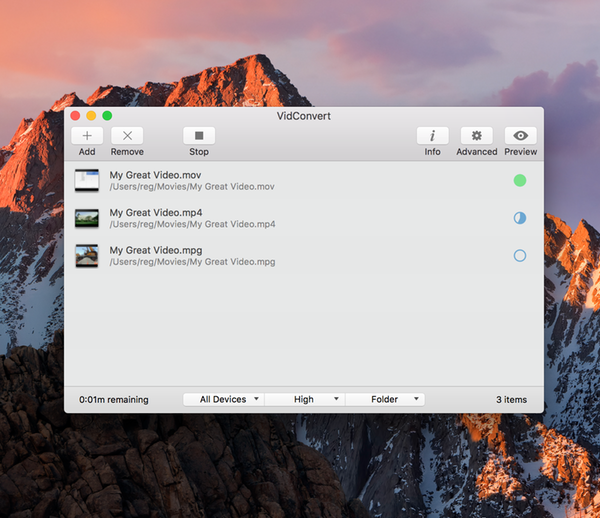 Creating videos for your iPhone or iPad, for your Mac or TV, or formats such as DivX and MPEG are just a click away with VidConvert. Version 1.6.6 introduces Korean localization and a number of other fixes and improvements. For full Release Notes visit their website. VidConvert 1.6.6 is only $7.99 (USD) for a single user license. A demo which creates 3 minute samples is available. Older versions with pre-Lion support are available via the website. And Mac App Store version also available. Based in sunny Anaheim, California, Reggie Ashworth is an independent software developer whose passion for the Mac platform is only exceeded by his aim to craft simple, yet useful utilities. He is fanatical about total customer satisfaction. Copyright 2006-2016 Reggie Ashworth. All Rights Reserved. Apple, and the Apple logo, are registered trademarks of Apple Computer in the U.S. and/or other countries.